When we were in Paris, we had a very tasty dessert featuring Calvados, an apple brandy from France. It was served poured over the top of an apple gelato that had a slightly limey taste. As we ate the dessert, we alternated between smacking our lips and trying to figure out exactly what was in it so that we could recreate it once we were home. This weekend, we gave it a try, and although I did not get it just right the results were delicious. The resulting dessert was less citrusy but tasted more like apple pie. It was creamy, flavorful, and a refreshingly light dessert that is the perfect end to a meal on a hot day. Adding a little Calvados to the top adds a little extra flavor and creates a slightly boozy float. The gelato is good enough to stand on its own, so feel free to omit the Calvados. If you don’t have Calvados but still want to add something, I’d suggest using brandy or bourbon in its place. Place apples, lemon juice, water, and 2 T. sugar in a pan. Bring to a boil, then reduce heat and simmer for 30 minutes. Remove from heat and let cool for a few minutes. Pour into blender and puree until smooth. Strain, reserving all of the liquid and discard the rest. In a double boiler, heat creamer until very warm but not boiling. In a small bowl, whisk together 2 T. of the hot creamer with the egg yolk, until well combined. Add egg mixture to remaining creamer and whisk until combined. Add sugar, and continue to stir until it thickens enough to coat the back of a spoon. This usually takes about 10-15 minutes. Remove from heat and combine the apple mixture and creamer mixture. Cool in refrigerator for an hour, then churn in ice cream machine according to manufacturer’s directions. 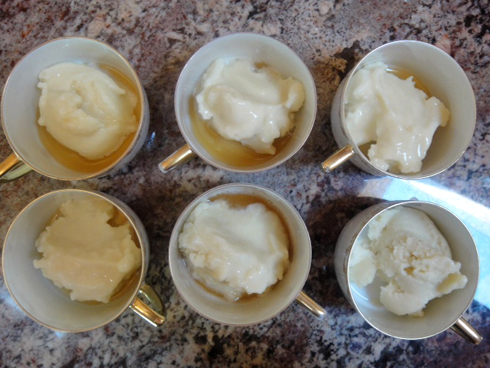 When ready to serve, place a scoop of ice cream in each dish and top with 1 T. Calvados. I am actually drooling. Yummy!